Nine-year-old William Kelleher and his nana Nora had a bird's eye view of Cork City's parade after William decided to take matters into his own hands and book a hotel room with a view. Nora Horgan, from Mayfield, has not been to a St Patrick's Day parade in over ten years because she has a bad back. But her grandson, who was sad that she was missing the parade, decided he was going to do something about it. Every Friday, since last May, he has gone into the newly-built Maldron Hotel on the South Mall and put his pocket money towards payment for a room. William said nobody believed him at first when he said he was going to do it but he did and Nana Nora said she was absolutely delighted. The two of them, she says, are the best of buddies and she could not believe it when he first told her last October. William said he was looking forward to absolutely everything in the parade and was so excited. There also was a special treat waiting for the Blackrock youngster when he arrived into the hotel. An anonymous person had left a gift voucher for him at reception to be used in a local toy shop. 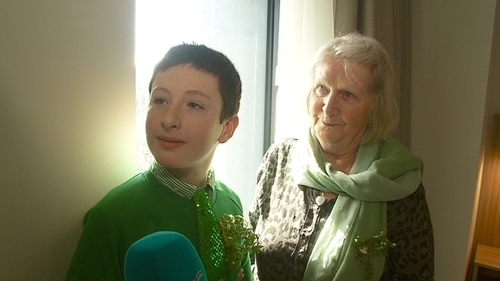 William's parents, Liz and Alan, said that for years they used to watch the parade from in front of what was a derelict site on the South Mall, but when William saw a hotel being built on the site he got the idea to book a room ensuring his beloved Nana would not miss another St Patrick's Day parade.